Badminton shoes are designed for badminton movements; a thin but well supported sole with good lateral support keep the player’s feet close to the ground, this allows for fast and ankle bending directional changes with lower chance of injury; light weight for faster feet movement; surface hugging gummy soles to grip the indoor surface without slipping. The amount of torture we subject our lower body to can clearly be seen in people’s badminton shoes. A good pair of badminton shoes used by a decent player sometimes last only 3-6 months. At the end of its short life, you will find soles that are worn to the inner support, insoles that are worn through, strong upper leather that gave up and split due to the immense force exerted at it. The number three unsung hero of badminton equipment is the badminton grip. Similar to the string being the interface to the shuttle, the grip is the interface to the badminton player’s finger and hand. 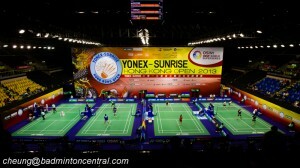 The game of badminton comprises of many very delicate movements and fine control from the player’s finger and wrist. A proper grip ensure that there is proper actuation and feedback to and from the racket. Badminton rackets comes in two major head shapes: Isometric/square and Oval. Oval is the traditional racket shape, it is a slightly bottom heavy oval, almost the shape of an egg. Oval rackets in general have a small but more concentrated sweet spot. Oval fans like the concentration of power around the sweetspot of the racket. The shape is the Isometric or square which became more popular after the early 1990’s. The Isometric head has a wider and more squared top half of the racket head. The advantage of the isometric is an enlarged sweetspot which give off-centered hit a better response. Rackets comes in different weights. Normally the racket alone weighs between 80-95g. Different manufacturers have different rating system, the most popular of which is Yonex’s U system, U = 95-100g, 2U = 90-94g, 3U = 85-89g, 4U = 80-84g. a racket’s weight determines how fast one can swing a racket, the lighter a racket, the faster one can swing it with the same force. In general, a lighter racket is more maneuverable than a heavy one. However, before everybody goes out and buy the lightest racket, I also want to point out that lighter isn’t always better. A light racket is less stable than a heavier racket, more force is necessary to keep its path, furthermore, a heavier racket has a larger momentum and thus more effective in transferring its speed and power to the shuttle. As you can see, none of the different properties of the above characteristics are strictly better than other. Some players prefers slightly heavier rackets, some prefer slightly lighter, some like even balanced, some like head balanced. What I want to point out is that ultimately, it is a person’s skill level and style that determines what racket is suitable, go try them out if you can to see what fits. Badminton clothing is quite simple to choose. Aside from one personal fashion preference, badminton clothing is better kept light and unrestrictive. Shirts needs to be slightly loose and comfortable to allow for arm and body movements. Badminton is a game of sweat, very often we see a badminton player walks out of the court like he just came out of a shower. As it is always uncomfortable to have sweat stuck to one’s skin, sweat absorption and dissipation is thus important. I used to be keep it simple with cotton shirts and swore by it. However, nowadays you will find me wearing a high tech sweat-wicking shirt. The technology has come a long way and they do work well even in hot weather. I only use cotton shirt after cooling down at the end of the day for the comfort when travelling from the club to home. I have mentioned it once and I will do it again here, while equipment is essential in badminton, the most important factor in badminton is still one’s badminton skills. Equipment will only have marginal effect on one’s game.